These headaches are usually caused by cigarettes, alcohol or high altitudes. In certain rare cases, foods high in nitrites such as bacon and preserved meats can also be to blame. They occur more frequently in men, and can be treated with triptans or in the case of high-altitude sickness, oxygen. Avoiding alcohol, cigarettes and medications such as nitroglycerin that cause blood vessel dilation could also help. If you’re fond of your coffee and consume a considerable amount of it over the course of a day, your brain gets used to the daily dose of caffeine. And if, for some reason, you don’t get your usual quota the brain goes into withdrawal — and wham, you end up with a nasty caffeine headache. There are only two solutions to this: either ensure that you drink your usual amount of coffee at the usual time or wean yourself off it entirely. This headache deserves a mention because it’s so common — even if it’s one of the mildest forms. You probably call it a “brain freeze,” but its medical name is sphenopalatine ganglioneuralgia. Ice cream headaches are caused by eating frozen foods (like ice cream!) and the only remedy is to slow down, stop eating for a minute or so, or rinse your mouth with warm water. 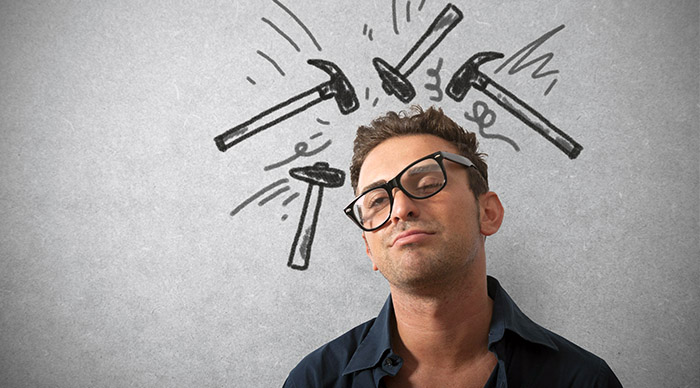 This is the most commonly occurring headache, and it’s usually caused by stress. It could also be due to bad posture or an unconscious clenching of the jaw. A tension headache is characterized by a throbbing sensation, and a constant aching pressure on the sides of the head or in the neck and behind the head. If left untreated, it can become severe. The best remedy is usually a regular painkiller, like acetaminophen, ibuprofen or aspirin. To avoid tension headaches in the future, manage stress, watch your posture and breathing at all times, and think positive. This type of headache is caused by dental conditions, like bruxism, or grinding your teeth at night. Problems with your jaw affect the ligaments, muscles and cartilage in the jaw, which radiate to the upper head, resulting in a headache. A dentist will be able to help you treat the source, as well as provide relief through hot or cold packs, bite guards, or sometimes medication. Women experience a drop in estrogen levels just before their period starts. This causes what’s known as PMS. Headaches are a common symptom, and they usually pop up between three days before and two days after menstruation. These headaches are of the less-serious variety, and can be treated with over-the-counter headache medication. You can also naturally help prevent menstrual headaches by staying hydrated and keeping centered through meditation, yoga or other forms of exercise. These are considered the most severe type of headache — and they’re three times more likely to occur in women than men. Although the exact cause isn’t known, migraines are thought to be caused by triggers like skipping meals, hormonal imbalances or irregular sleeping habits. Migraines can be treated with drugs such as acetaminophen, ibuprofen, or triptans. Personally, I also found some great natural ways to reduce migraine headaches were following a regular eating and sleeping schedule, cutting out caffeine and alcohol, and avoiding loud noises and bright lights. It’s believed that “weekend headaches” are caused by oversleeping on your days off. They’re particularly common among people who have a stressful week, and insufficient and irregular sleep on weekdays. The best way to prevent this is to regulate your sleep schedule as much as possible throughout the week.